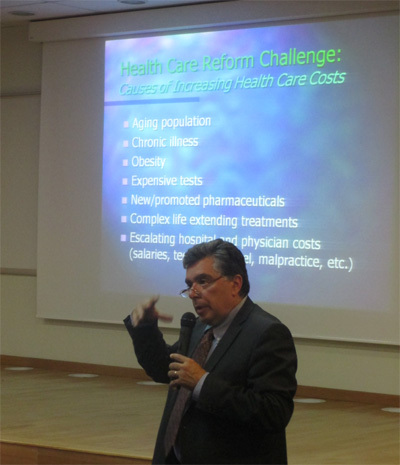 On September 26, 2013 the AUA School of Public Health (SPH) hosted Michael S. Varadian, a senior health official from the US, who led an interesting and interactive seminar on National Health Reform in the U.S. or “ObamaCare” – a hot topic as October 1st is the first big start date for the U.S. states for offering expanded enrollment in health insurance on health exchanges, where people can choose the insurance plan they want to get covered for 2014. Mr. Varadian explained the main goal of this reform – to provide an opportunity for more U.S. citizens to access affordable, quality health insurance and to reduce the growth in health care spending in the U.S. He emphasized “With over 50 million Americans uninsured and another 25 million under-insured, this has become a major issue across the nation. The country has been struggling with unaffordable health insurance, increasing healthcare costs and chronic illnesses, which need to be better managed and coordinated for improvements in health and costs to occur”. He also spoke about the challenges of enrollment of the multi-millions of individuals on the health insurance exchanges, which are scheduled to begin in twenty-five states. 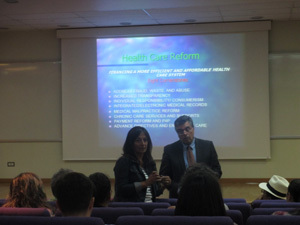 The MPH students, faculty, and alumni were eager to learn more about the recent health reforms in the U.S. and compared them with recent reforms in Armenia. Michael S. Varadian JD, MBA, is currently the Executive Director of Rhode Island Department of Behavioral Healthcare, Developmental Disabilities and Hospitals and is responsible for all national health reform pilot programs with Medicaid. He was also the Executive Director of Rhode Island Department of Health responsible for all hospital, clinician and health care facility licensing, regulations and inspections. Previously, Mr. Varadian was the Senior Coordinator for Health Care Services at the Massachusetts Office of the Inspector General and was responsible for all healthcare investigations and oversight of statewide funding of health reform activities. Among other legal, regulatory and administrative roles, his career began as hospital administrator at Newton Wellesley Hospital, a 350 bed teaching hospital in the Boston area. 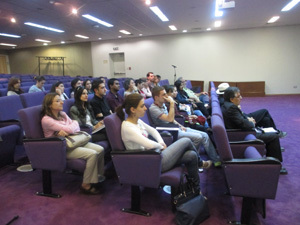 an MBA from the George Washington University, Washington, DC; and a JD from Suffolk University, Boston, MA.